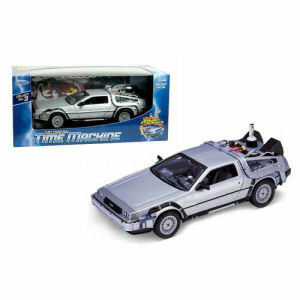 We have Just Sold out of Back to the Future 2 DeLorean 1981 Time Machine Die-Cast Metal 1/24th Scale Vehicle. Not to Worry! Fill in the Notify me When Available and you will be the first in line for our restock of Back to the Future 2 DeLorean 1981 Time Machine Die-Cast Metal 1/24th Scale Vehicle !! From the Back to the Future collection by Welly. Back to the Future 2 DeLorean 1981 Time Machine Die-Cast Metal 1/24th Scale Vehicle. Measures 7 inches long. Highly detailed 1/24 scale die cast vehicle. Welly Back to the Future Die Cast shipping from Canada. No Surprise Border fees or Customs!